I saw something on this event on the last airing of “State of the Gulf – America’s Sea'” on PBS. The turnout is just amazing considering the location, and if I weren’t already schedule out of state, that would be the place for me. From what I saw on the segment on the “Big Shell Beach Cleanup,” their trash collections are weighed in the tons. Attention Volunteers! The 2011 Big Shell Beach Cleanup is scheduled for March 19th this year. This event just can’t happen without the help of our volunteers and your help is needed again. See you there! The 16th Annual Big Shell Beach Cleanup will be held Saturday, 19 March, 2011. Volunteers will meet at Malaquite Pavilion on PINS and the event will commence at 7 a.m. To reach Malaquite Pavilion just stay on S.P.I.D. through Corpus out onto N. Padre Island where it becomes Park Rd. 22. Just keep driving till you come to the entry gate of PINS. Tell the attendant you are there to volunteer for the beach cleanup and you will not be charged admission. Volunteers will gather at the Malaquite Visitor’s Center for instructions and will return to the pavilion by 2 pm. 4 wheel drive vehicles, trailers for hauling trash in and out of the work area and working volunteers are needed. Walking volunteers are welcomed and those without 4 wheel drive vehicles will be afforded transportation to and from the work area. Those unable to pick up trash but having 4 wheel drive vehicles are most welcome to aid in hauling volunteers. The event doesn’t re-schedule and will take place rain or shine. 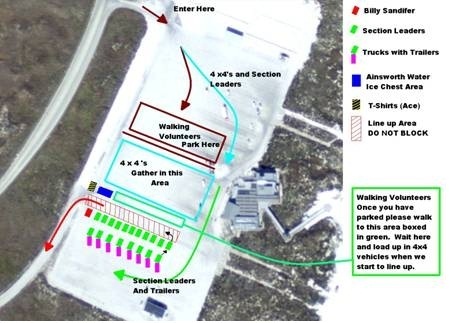 Use the map below to help coordinate where to line up, park, and get ready at the Malaquite Visitor’s Center. Snacks, water and soft drinks will be available in the work area and refreshments will be available at Malaquite following the event courtesy of CCA Corpus Christi Chapter and Dominos Pizza. Long trousers and sturdy foot wear are recommended. Don’t pick up broken glass or flammable items. Report them to your section leaders. Volunteers will receive event t-shirts. This is a worthy event and it’s only possible because of volunteer participation. Won’t you please come and join us.